A long time ago, losing a tooth was an exciting occassion. Remember? You put the tooth under your pillow, the tooth fairy came while you were sleeping, and in the morning.. CASH! As an adult, tooth loss is not an exciting occassion. The reasons for tooth loss—severe decay, injury, damage, periodontal disease and infection—are all quite serious. Missing teeth can cause bone loss and really impact how you feel about your smile. Replacing missing teeth is essential to both your oral and overall health. There are several options for tooth replacement such as dentures or a multi-unit crown and bridge, but for the most functional and aesthetic results, dental implants are the preferred choice. A dental implant is a small titanium post that Costa Mesa dentist Dr. Jorgenson and periodontist Dr. Joseph Yang surgically embed in the bone of your jaw where you lost your tooth. 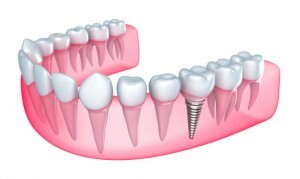 Dental implants are an excellent and permanent solution for missing teeth. What you may not know is that dental implants are a perfected science of replacing a real tooth with an artificial tooth that looks, feels, and functions just like a natural tooth! Many people only think about the visible ceramic tooth restorations attached to the post when they think about dental implants, but there are several steps involved in the dental implant process. . Depending on your specific case, Dr. Jorgenson and Dr. Yang will determine if the implant can be placed on its own or if the best outcome will also include a bone graft or sinus lift. The goal of the dental implant is to create a permanent, long-lasting solution so there are times when the bone must be reinforced first. Once the implant has healed, Dr. Jorgenson will complete the implant restoration. In the case of a single missing tooth, you’ll need just one implant to anchor the crown. For several missing teeth or even an entire arch, we can strategically position several implants to secure a non-removable denture. These teeth will all be permanent and look and feel like real teeth as well! Firstly, dental implants are natural looking and comfortable. The implant is integrated into your natural jaw structurewith your bone tissue to form a solid foundation that is remarkably similar to a tooth root. You won’t even notice the difference! Second, that bond between the implant and bone helps to prevent bone loss. Bone loss can cause your jaw line to receed and can change the shape of your face. Other tooth replacement choices merely rest on top of your gums and, therefore, provide no stimulation to your jawbone. A dental implant, however, recreates the relationship that existed between root and bone, thereby deterring the bone resorption that can often lead to a sagging facial appearance. Third, dental implants are a permanent, long-lasting solution. You don’t have to worry about replacing a decayed bridge or redoing a removable denture that you’ve misplaced. The tooth is yours and is part of your natural jaw structure. Only in unusual circumstances would implants need to be replaced. At Advanced Dental Care, Dr. Jorgenson will perform a Free Dental Implant Consult to determine if you are a good candidate for dental implants. Sufficient bone density is key, but a bone graft procedure can be done to buildup bone if necessary. If you are a candidate, our staff will work with your dental insurance to obtain payment or assist you with other financial options if needed. Once the implants are placed, you’ll need several months to heal and to allow the post and the surrounding bone to fuse together. After this time, you’ll return to Advanced Dental Care where Dr. Jorgenson will attach the custom crown or denture to the abutment to complete the dental implant process. If you would like to learn more about dental implants, or to find out if this tooth replacement option is right for you, call Advanced Dental Care in Costa Mesa, CA. Free Dental Implant Consultations are provided by Costa Mesa dentist Dr. Jorgenson. Dr. Jorgenson and the Advanced Dental Care staff proudly deliver quality dental care throughout Irvine, Newport Beach, Huntington Beach, and the surrounding Orange County, CA, communities.